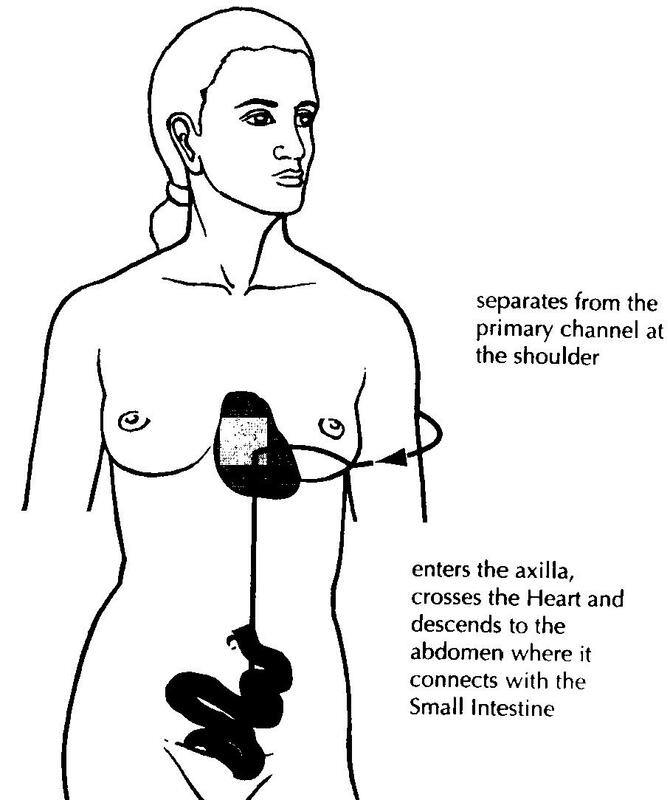 Departing from the Stomach Meridian on the thigh, it enters the abdomen, connects with the stomach and disperses into the spleen. Then, ascending through the heart and alongside the esophagus, it reaches the mouth. Continuing upward, it runs beside the nose, connects with the eye and finally joins the Stomach Meridian. Its Access Point is S 30 (Qi Chong or Surging Qi), which is close to the departure point, near the symphysis pubis and inguinal ligament as described in (2). Its Return Point is officially B 1 (Jing Ming or Bright Eyes, which is near the inner canthus of the eye. Needling this point can be stressful to most patients and S 1 (Cheng Qi or Tear Container) is used instead. There is a branch from S1 to B 1 (2). Diverging from the Spleen Meridian on the thigh, it converges with the Stomach Divergent Meridian, runs upward to the throat, and finally enters the tongue. Another description of the departure point is near the symphysis pubis and inguinal ligament (2). Its Access Point is Sp 12 (Chong Men or Surging Gate), which is near to the departure point in (2). It has the same Return Points described in (a). The region of greatest activity for this couplet is the abdominal and pelvic cavities (uterus, ovaries, large and small intestines, stomach and spleen). However, the esophageal, tongue, nasal, frontal and maxillary sinus regions also can be treated with good results. It starts by leaving its principal meridian from the posterior aspect of the shoulder, passes downward to the axilla, goes deeper to pass into the heart and then further downwards to pass into the small intestine. 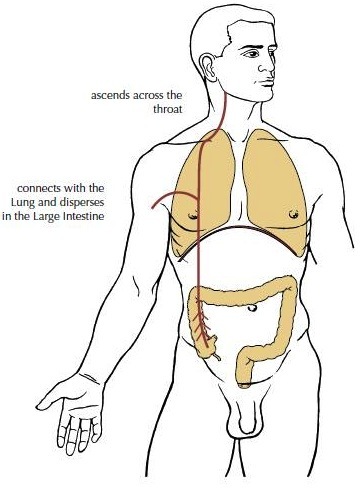 The Small Intestine Divergent Channel then joins its principal meridian, which it follows upward through the throat. Finally, it runs in a branch of the Small Intestine Meridian to terminate at the inner canthus of the eye at B 1, joining the Heart Divergent Meridian. Its Access Point is SI 10 (Nao Shu or Upper Arm Shu) and its return Point is B 1. 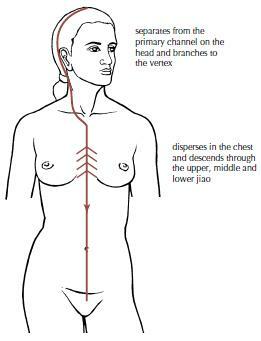 After diverging rom the Heart Meridian in the axillary fossa, it penetrates the chest and enters the heart. Then it ascends to the throat, emerges on the face and joins the Principal and Distinct Meridians of the Small Intestine at the inner canthus of the eye (B 1). Its Access Point is H 1 (Ni Quan or Highest Spring) and its Return Point is B 1. This couplet’s pathway passes through the heart and loops through the small intestine. However, its range of influence is limited to the heart and pericardium and their immediate vicinity. Even though it passes through the small intestine organ, clinical results show that it is not effective for treating abdominal problems. These pathways are the most poorly defined and also used the least in clinical applications. The San Jiao Meridian has a branch which connects to Du 20 (Bai Hui or Hundred Convergences), from which the San Jiao Distinct Meridian takes its origin. 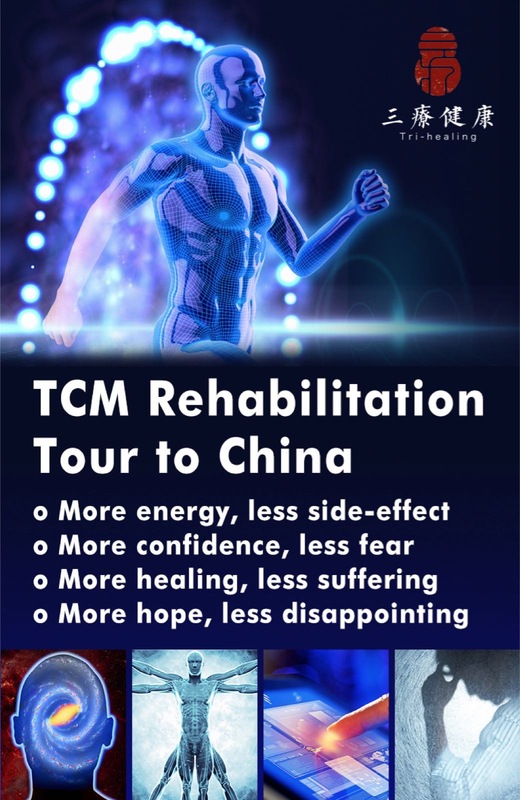 From there it descends behind the ear to SJ 16 (Tian You or Celestial Window), where it meets the Heart Divergent Meridian and also has a connection with the brain. Then, it descends through the supraclavicular fossa and penetrates the thorax to disperse into the Upper. Middle and Lower Jiaos. Its Access Point is SJ 16 and its Return Point is Du 20. It starts 5 cun below the axilla (1), while other sources (4) state the starting point as P 1 (Tian Chi or Celestial Pool). It travels to the chest, penetrating deeply and branches into two. The descending branch communicates with the Sanjiao. 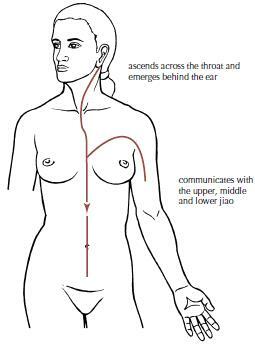 The ascending branch passes through the thorax, becoming superficial at the neck, and unites with the Divergent and Principal Meridians behind the ear at SJ 16. Its Access Point is P 1 and its Return Point is Du 20. This couplet influences the body’s autonomic activities. The functions of the Pericardium are likened to those of the sympathetic nervous system, while the functions of the Sanjiao to those of the parasympathetic in (2). It separates from the Large Intestine Meridian on the hand and ascends the arm to the shoulder to LI 15 (Jain Yu or Shoulder Bone) according to (1). However, in (4) this is its starting point. Two branches are formed at LI 15. One travels backward over the superior border of the scapula to meet the spinal column at Du 14 (Da Zhu or great Hammer). The other branch travels anteriorly to the chest, where it goes deep and branches into two. The descending branch penetrates the large intestine. 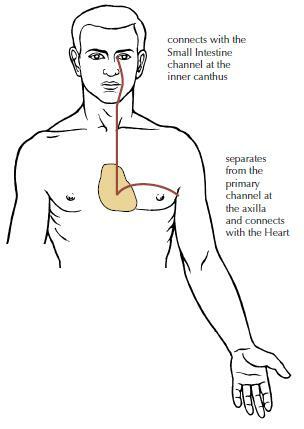 The other branch ascends through the lungs to surface at the supraclavicular fossa at S 12 (Que Pen or Empty Basin). Then it passes up the side of the neck to LI 18 (Fu Tu or Protuberance Assistant), where it unites with the Large Intestine Meridian and the Lung Divergent Meridian. Its Access Point is LI 15 and its Return Point is LI 18. It derives from the Lung Meridian in the axilla, runs anterior to the Pericardium Meridian into the chest, penetrates into the lungs and branches into two. One branch descends to penetrate the large intestine. The other ascends up the throat to LI 18, where it joins the Large Intestine Distinct Meridian. Its Access Point is L 1 (Zhong Fu or Central Residence or Central Treasury) and its Return Point is LI 18. This couplet influences the associated respiratory contents of the thorax (the trachea, vocal cords, larynx, pleura, lung parenchyma and bronchi). Even though it passes through the large intestine, it has no influence on this organ. Clinically, this organ is affected by the Liver/Gallbladder, Spleen/Stomach and Kidney/Bladder Distinct Meridian couplets. Non-acupuncturists can influence the Divergent Meridians using Tuina (6). 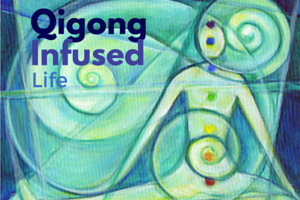 Another possibility, instead of actual needling, is to follow the proper acupuncture protocol, but use the Qigong invisible needle technique, as described in (5). The Distinct Meridians are not use to treat functional problems or energetic disturbances, but disorders of a material basis that can be detected by examination of biopsied tissues, laboratory specimens, x-ray or nuclear medicine studies. They can be used as a first approach to acute problems before surgical or pharmaceutical therapies are initiated, as an adjunct to the conventional treatment or after the medical treatment has failed. (a) Needle the Access Points bilaterally on both the Yin and Yang Principal Meridians. (b) Needle the Return Point bilaterally on the Yang Principal Meridian. (c) Use Mu, Shu or local points to focus the energy flow to the desired anatomical region. The couplet pathway influences an anatomical region as much as it influences the two associated organs. In some couplets only one organ lies in the region of greatest influence. In others, both organs are in the anatomical region, but the influence of the Divergent Meridians on the region is greater than on the organs. 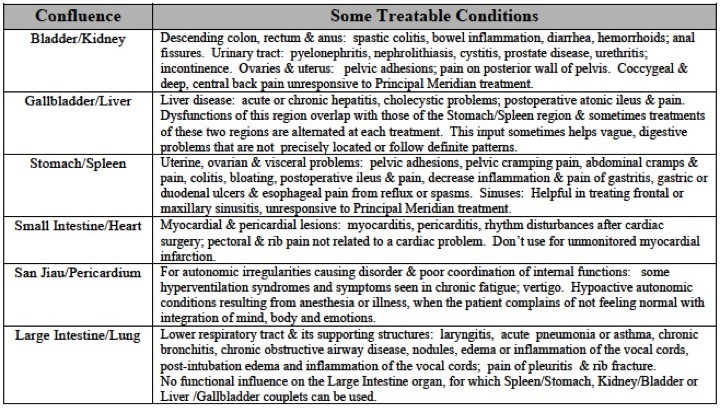 Table 1 lists some conditions that can be treated by using the Divergent Meridian couplets. 1. Deadman, P., Baker, K. and (Author), Al-Khafaji, M. A Manual of Acupuncture. Eastland Press, Vista, CA, 2007. 2. Helms, J. M. Acupuncture Energetics: A Clinical Approach for Physicians. Medical Acupuncture Publishers, Berkely, CA, 1995. 3. Maciocia, G. The Foundations of Chinese Medicine. Churchill Livingstone, New York, 1989. 4. Royston, L. The Secondary Vessels of Acupuncture. Thorsons, New York, 1983. 5. Johnson, J.A. 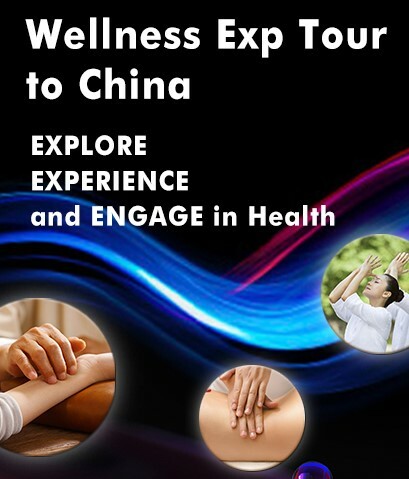 Chinese Medical Qigong Therapy. Int. 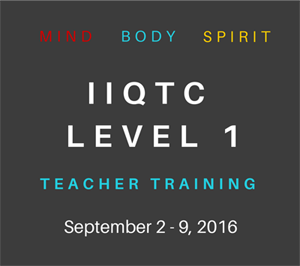 Institute of Medical Qigong, Pacific Grove, CA, 2000. This entry was posted in Scientific Qi Exploration and tagged acupuncture, Chinese Medicine, Marty Eisen, Scientific Qi Exploration. Bookmark the permalink. then you will definitely obtrain pleasat know-how.